Hydro Tek HN Series, Stationary Electric Powered, Natural Gas, LP or Diesel Heated, Industrial power washer is Made in the USA for industrial use. The HN Series is a stationary hot water pressure washer that is powered by electricity and heated by your choice of natural gas, propane or diesel. This allows you to install indoors and have hot water on demand in your wash bay at your facility. These models include stainless steel panels, industrial duty motors and pumps and a lifetime heating coil warranty. 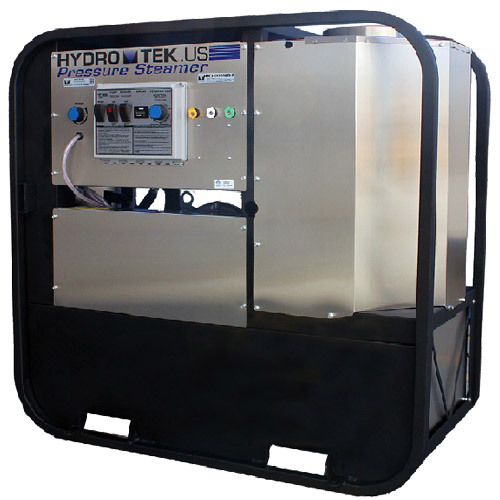 Hydro Tek HN Series Hot Water Pressure Washer, Stationary Electric Powered, Natural Gas, LP or Diesel Heated, Industrial power washer is Made in the USA for industrial use. The HN Series is a stationary hot water pressure washer that is powered by electricity and heated by your choice of natural gas, propane or diesel. This allows you to install indoors and have hot water on demand in your wash bay at your facility. These models include stainless steel panels, industrial duty motors and pumps and a lifetime heating coil warranty. No need to fill fuel tanks or hunt down a water supply when machine is directly plumbed into natural gas and water lines. The pressure washer can be housed indoors, away from the elements, while installing wash stations remotely outdoors. 24v automatic, electronic ignition on low emission natural gas burner. Liquid Propane conversion option or diesel heated option is available on any model. The coil is a Hydro Tek manufactured SpiraLast™ heating coil. Robotically fused ½” schedule 80 steel pipe is cold rolled to protect the steel pipe from fatigue and the spiral coil is then surrounded by ceramic insulation and stainless enclosure with double-wall end caps. Ask your dealer about theLifetime Coil Warranty. diagnostic indicators ensure optimal system performance. Dual voltage switch on most 230v models allows you to simply flip a switch to change to 208v power supply. Worry free pump cooling system prevents pump from overheating with system designed pump bypass feature. Welded, powder coated steel, pro-tect-it frame for durability with rustproof stainless coil wrap and front panels. Forklift slots and overhead lifting points to safely reposition machine. Frame integrated hold down tabs. Stainless steel frame option as well as an option for a removable, stainless back panel available. Easy-remove panels on an open frame design with open backside gives you full access to all components, including EZ Align™ belt tensioning system, electrical box, and burner igniter for efficient preventative maintenance checks. Heavy duty industrial motor with standard thermal overload protection. Remote Ready: Choose an on/off timer remote option or a full function remote option for complete control from the wash site.